The Western Red Cedar Porch Swing seats two comfortably, measuring approx. 23" high x 52" wide x 27" deep. The seat surface is approx. 18" deep x 48" wide. 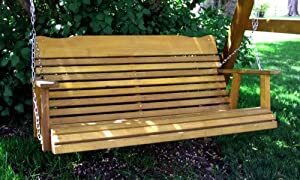 This traditional natural wood swing comes with comfortable contoured seating, chain and springs. All the swing needs is a view. Our lawn and garden furniture is shipped partially assembled, with easy to follow instructions. All of our patio furniture products are made from natural tight knotty cedar with non-staining hardware. Cedar is lightweight, dimensionally stable, and naturally resistant to splitting, cupping, and warping. Western Red Cedar gives our patio furniture natural strength, beauty & natural resistance to the elements. Are you thinking that your porch may not be right for a swing? Please take a look at our compact self-contained cedar gliders. We also offer a 5' version of our swing. Each piece is ready for staining, clear finish or simply leave natural. An oil or clear finish with UV light protection will bring out the beauty of the grain and a bit of red tinge in the wood. If the cedar is left natural, it will weather to an unpretentious gray. Are you thinking about a finish? A very traditional rustic look can be done with polyurethane with UV light protection. This will slightly darken the wood while bringing out a bit of red tinge found in the grain. Stains are easy to apply and can be found in most colors. An alternative type of stain is an opaque stain, which looks like paint, but doesn't chip or peel as can happen with paint. You should apply a finish that will waterproof the wood, and prevent water spots & stains from ruining the look of the wood. Please consult your local paint expert, as there are always new products coming onto the market. OPTIONAL natural tone stain finish is available for a nominal fee. We ship by UPS ground only within the Continental US - sorry we don't ship to Alaska, Hawaii nor outside the United States. Shipping is added to all furniture orders.